Just a quick blog post on the new "Lost University" website (see previous entry). 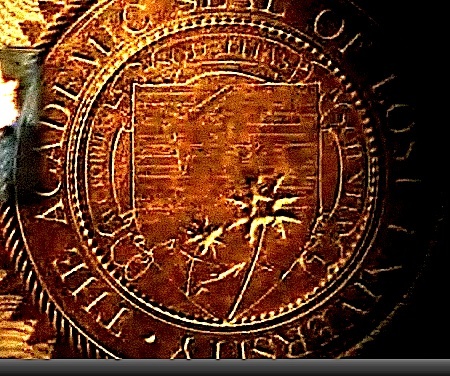 One thing that bugged me was the University's seal, which appears on the website in small, and VERY briefly in big on the video. It shows palm trees, what appears to be a book or piece of paper, and a plane over it. Nothing new there. But I liked that there seemed to be a little bit of Latin in the middle, and wondered what the motto for Lost University is. It was time for a little digging... click on the image below for full-size. Unfortunately, my attempt to get someone to CSI it failed miserably... apparently you CAN'T zoom it, clarify and see what's in the reflection of someone's eye with standard software. Who knew! Anyways, so I had to use old fashion squinting. The easiest to decipher was the second word, which I managed to get the first part of "sod". Using this as a Latin stem, I found only a few possible words, and the only one that fitted in terms of character length was "sodalitas", meaning "an association, comradeship, fellowship". Seems to fit in with the University feel, wouldn't you agree? The next bit I guessed at was the first word, the start looked like "auc" and the end "as". Breaking it down, I took a guess and I believe the best possibility is "auctoritas", meaning "support, influence, warrant, authority, rights, command". From here, I decided to have a Google, and weirdly found top of the list for "auctoritas sodalitas" a link to facebook.com/Lost to a post by a guy called Derick saying simply "Auctoritas Sodalitas Scientia". Sure enough, "scientia" seemed to match the final word from the seal, meaning "knowing, knowledge, acquiantance, skill". So our Lost University motto is, I think the best translation of it taken together is "authority, fellowship, knowledge". I wondered whether this random guy on Facebook's LOST page was just a fan as geeky as me, but the comment was posted 15 hours ago, 04:00 GMT, like the time the site went live almost. I don't see the motto posted anywhere else on the web... how could this guy know? Or maybe it is on the Internet someplace. Update: Derick seems to have also posted on DarkUFO's Facebook page when he posted on the LOST one. After a little PI work, I've come to the conclusion this is a real guy and not part of some ARG conspiracy. How he knew the motto is beyond me, but you can quote me on not thinking that he's our new Rachel Blake. It's an odd thing, but nothing to think more on. The Lost Rewatch: 1x24 "Exodus, Part 2"
The Lost Rewatch: 1x23 "Exodus, Part 1"
The Lost Rewatch: 1x22 "Born to Run"
The Lost Rewatch: 1x21 "The Greater Good"
The Lost Rewatch: 1x20 "Do No Harm"
The Lost Rewatch: 1x19 "Deus Ex Machina"
The Lost Rewatch: 1x18 "Numbers"
The Lost Rewatch: 1x17 "...In Translation"